Anything that flowers in the winter months should be celebrated especially if it’s pink! Plant Viburnum x bodnantense ‘Dawn’ in your garden and it will reward you with colour on a cold, grey day. 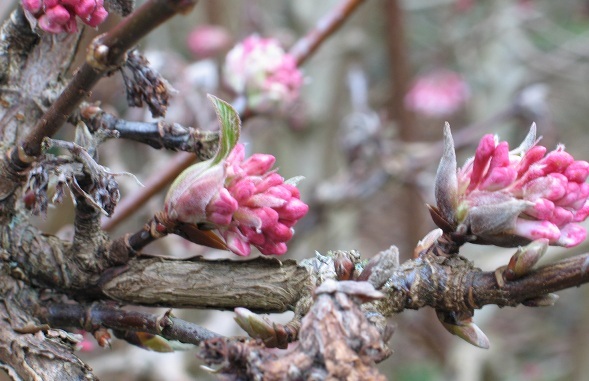 It’s a mediumto large sized deciduous shrub with attractive bronze foliage in autumn and exquisitely fragranced flowers fom November right through till March. They prefer moist but well drained soil in sun or partial shade. Bring some indoors as a few cut sprigs for the house and put in water and you’ll be suprised at how long they last.